When I was a kid, I would play video games so much that I had to constantly beg my parents to keep a reserve of batteries in the house. We actually stashed them in the refrigerator, believing that having them at a colder temperature would somehow make them last longer. Whether or not that’s true, though, I cannot say. What I can say is that Dimension W needed to replace its own batteries at some point but never got the memo. 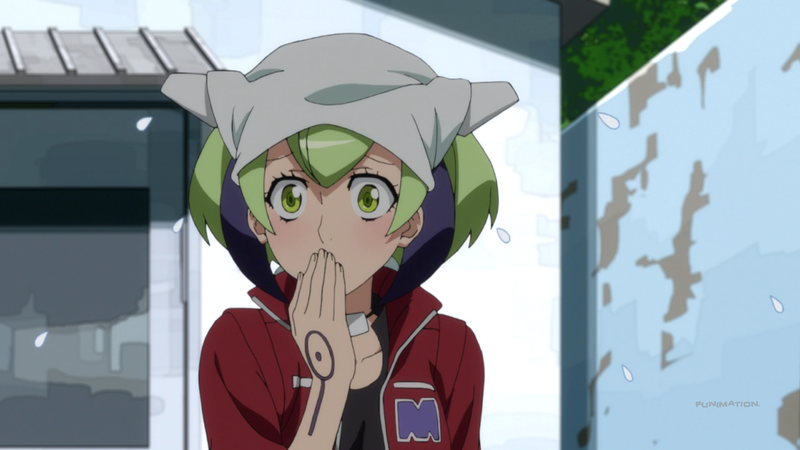 While not technically true, Dimension W has two halves: the first five episodes and the last seven episodes. The first five episodes do a nice job of presenting necessary information. The concept of Coils, the society built around the devices, and the futuristic setting are laid out. Mira, a unique cyborg, makes for a cute yet purposeful companion. And the importance of the so-called Numbers is made known. All within just the first two episodes. Episode three is more character oriented, but episodes four and five are more relevant narratively. Episode four includes an interesting setting relative to the one given prior, and episode five introduces the idea that Numbers allow for a myriad of possibilities – an important detail for later. Then the rest of the anime happens. Where the first five episodes were spread out in terms of focus, the last half of the anime hones in on one specific plotline: Easter Island. With the change in focus comes a drastic change in scale. Before, breaking into a museum, playing with a bunch of kids, and investigating a spooky mansion were as grandiose as the anime got. Afterwards, threats of global destruction, the end goal of the different cast members, and the political and violent direction each inflate the scale beyond what feels reasonable. Simultaneously, the anime tries and fails to introduce new narrative elements. Different villains that are either too silly or improperly explored join the fray. Random ideas, like a floating ball of energy or Mira moving through Kyouma’s subconscious, are difficult to accept even with all of the concurrent pseudoscience. Even certain plotlines, such as the bureaucracy finding out about Mira’s true origins, are discarded, making the anime come off as forgetful. In order to present a lot of this information, the anime relies on heavy exposition. Characters spill their thoughts through long-winded monologues. And thematic subtlety is traded for heavy-handed explanations, telling rather than showing its messages. Nevertheless, these themes are surprisingly complex: immutable history, acceptance of reality, and indeterminism. 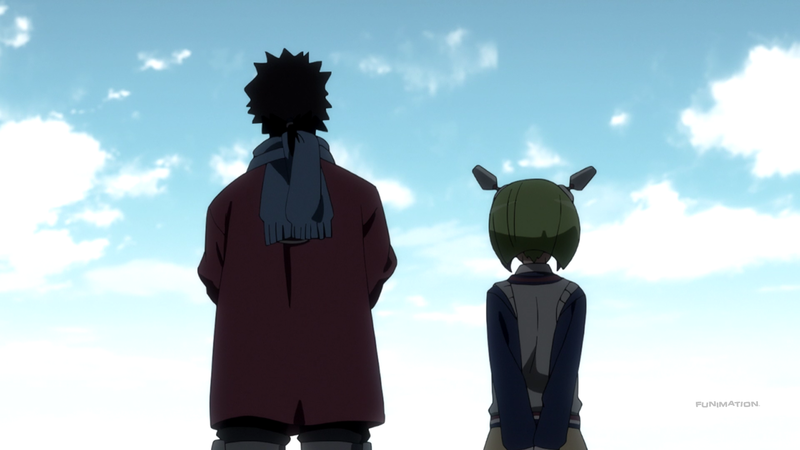 In Dimension W, many of the episodes focus on the past. Kyouma’s life and wife are presented entirely through flashback. The same happens for many of the events in the last half of the anime – how Kyouma came to acquire Genesis, what drove Seameyer to go insane, and so on. In a way, the anime demonstrates that the past cannot be changed. I.e., history is immutable. Along the same lines, the show pushes the idea that people have to accept this given reality. Both Kyouma and Salva refuse to acknowledge their pasts. For them (and anyone), it’s something that sticks no matter how much they may forget or not want to remember. Yet that does not mean what is to come is predetermined. For while the past cannot be changed, and the present must be accepted, the future has no such rules. The possibilities are endless. Mira does not have to sacrifice herself. Kyouma can turn a new leaf. Loser has every right to fight to save his beloved. Altogether, these themes have close ties to Dimension W (the concept, not the title). Dimension W’s voids symbolize history’s immutability through their stillness. The widespread use of Dimension W, despite it challenging established norms, represents society’s acceptance. And Dimension W creating multiple possibilities help to highlight that indeterminism still stands. The themes are both layered and connected, and the first half of the narrative is at least competent. But the numerous amount of issues in the second half are still enough to make the narrative an overall weak package. Dimension W’s artistic direction does have a few positives. It uses a visual trick to, at times, profile the characters. One-colored backgrounds and off-colored shadows give Kyouma, Mira, and others a poster-art look. The technique does not serve a purpose, but it does add flair. The outcome of interacting with Dimension W (the concept) is also an interesting choice. Grotesque mutations and otherworldly obstructions turn what should be a lauded discovery into a hideous amalgamation – a dichotomy reminiscent of the show’s own love-and-hate technology motif. The rest of the art tends to be hit or miss. On the hit side, the sprawling city – with its alleys, skyscrapers, and underground shops – adds variety as well as a futuristic yet realistic setting. 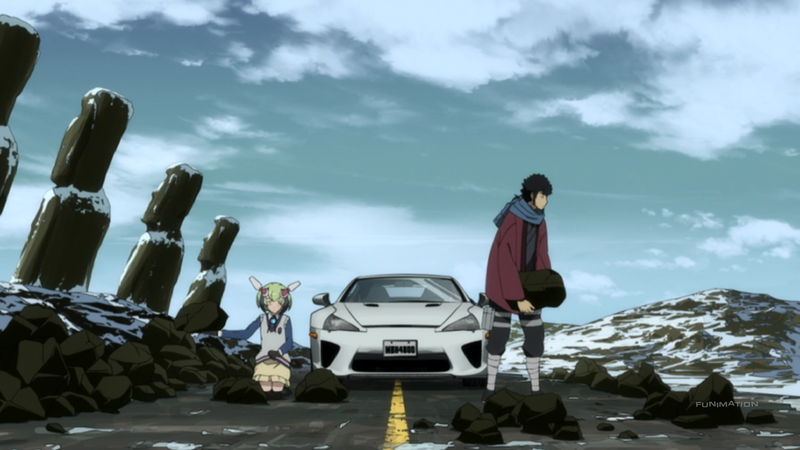 On the miss side, the monotonous mountains, snow, and derelict corridors that make up the vast majority of the second half of the anime replace the variety and futuristic details with repetitive, boring backgrounds. Actual animation remains roughly around average. Once again, a first-half-second-half distinction can be made. In the first half, Kyouma’s escapades and Mira’s silly reactions keep the anime from feeling static. In the second half, while the action involves robots of different types, the animation is not as fluid as it once was. Certain scenes can bring back that spark, like when Kyouma takes down a robot, but those moments are few and far between. If nothing else, the character designs manage to be both interesting, cool, and different compared to one another. Kyouma’s lion-esque hair and laidback attire paint him as both fierce and nonchalant. 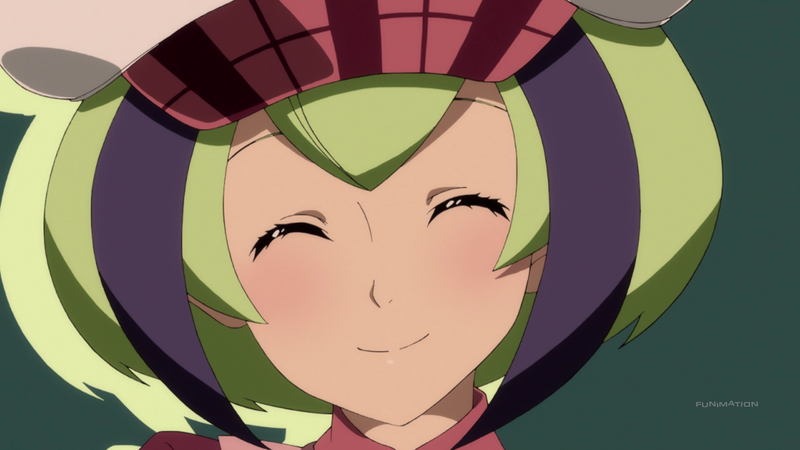 Mira’s green hair, catlike features, and various outfits (especially her bulbous hat) turn her into the cute and likable character that she is. And both Salva’s and Lwai’s appearances are exotic, fitting their royalty and foreign statuses. The cast of Dimension W is weirdly handled. Take Salva and Lwai. Salva’s backstory is shown, but the extent of his relationship to his brother (and his secretary that he constantly slaps) does not receive much attention. Lwai is similar. It is revealed later on that Lwai is actually in a comatose state, controlling, at the same time, robots that look like him. But beyond his devotion to his brother, he does not have much to his character. To be fair, his main purpose is to become friends with Kyouma before his revelation. By doing so, it demonstrates that Kyouma can, in fact, befriend a cyborg that uses the very Coils that he despises. But a weird problem arises: The anime spends almost too much time on the Egyptian brothers. Instead of focusing on other established characters, like Loser and Dr. Shidou (Mira’s father), the anime instead chooses to focus on these latecomers despite their relative unimportance to the plot. Worse still, the focus needed is stolen from others. Namely, Kyouma and Mira. Kyouma and Mira share a tenuous relationship. Kyouma despises Coils and, consequently, Mira. Mira does not hold any feelings of ill-will towards Kyouma, but she does wish he would treat her more like a friend (at least an acquaintance) and less like a piece of junk he picked up from the side of the road. So when Kyouma gets all buddy-buddy with Lwai, it almost feels like a betrayal. Granted, Kyouma does not know of Lwai’s personal background, but as he grows his relationship with the young boy, Kyouma (and therefore the anime) must subsequently disregard the relationship between him and Mira. Given that Kyouma and Mira’s relationship is easily more important to Dimension W when compared to Kyouma and Lwai’s relationship, it becomes hard to justify the anime practically forgetting about its main duo. Their relationship is weird, too. Mostly because the transition from Kyouma ragging on the young girl to tolerating her presence has little to do with each other. Yes, Kyouma saves Mira from certain death (twice), but his behavior towards her does not change as a result of their interactions together. Rather, the change occurs because of Kyouma learning more about himself. What he learns is memories he had essentially repressed. The girl he met, fell in love with, and married. The horrors he and his crew faced while scouring the island. The location of Genesis. A lot of these details helped to explain his current character. His wife imparted on him a love of old objects (which partly explains the muscle cars), and her death instilled in him a deep hatred for anything related to Coils (which also partly explains the muscle cars). His membership with the so-called Beasts of Grendel provided a foundation for his uncanny physical abilities. And learning the truth behind why his memories were disjointed in the first place allows him to understand his own origins. He believed that he failed his comrades and, more importantly, his wife. But who he truly failed was himself. He blamed the Coils for his losses rather than the choices he (and his wife) made, turning him into the angered man afterwards. In the end, Kyouma foregoes entirely hating Coils. His use of his signature Coil-based weaponry is evidence enough. But this change is only nice for him. He now views Mira more positively, sure, but, to reiterate, their change does not derive from mutual understanding. It’s a one-sided shift that the anime attempts to make balanced – but it fails. Mira’s character unfortunately gets sidelined by the aforementioned weirdness. The inordinate amount of time spent on less important characters, as well as her relationship with Kyouma going largely unexplored, leaves her in a difficult spot character-wise. At the minimum, she has a bit of uniqueness in the Dimension W world. While she is yet another cyborg, her make and conception are shrouded in mystery. Indeed, she is much more reactive and lifelike when compared to other similar cyborgs. Her affable personality, general cuteness, and overall calm demeanor make her an easily likable person. “Person,” not cyborg. For her major conflict involves a sense of self. She does not fully comprehend her origins – a parallel to Kyouma, one that gets surprisingly tied back with the revelation that her own body is in fact Kyouma’s wife’s body. She does not ever want to be reset, losing the relationships and experiences she has made thus far. And the idea of death scares her, for she knows that that means the end. Again, though, this conflict is not fleshed out. It comes together through small, singular scenes rather than through a layered approach. Yes, Kyouma stops Mira from sacrificing herself, proving to her and the audience that she is more than just a cyborg. But Mira does not experience so much development as she does a reaffirmation of what her character has symbolized from the beginning. After Kyouma and Mira, the rest of the cast is riddled with issues. Seameyer, the main antagonist, is awful. He appears out of nowhere, his motivations are laughable, and his overt craziness cannot be taken seriously. Loser (as was briefly mentioned) hardly receives any attention despite how much he is invested in the proceedings, and his own backstory is sloppily put together. 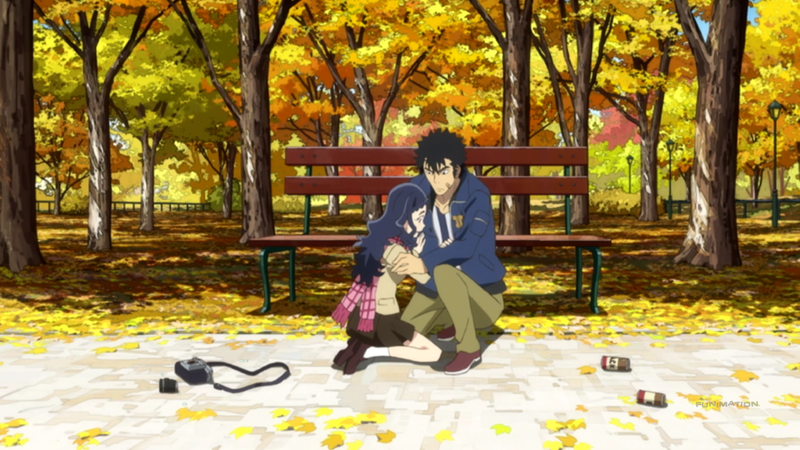 Plus, his relationship to his daughter, in contrast to Salva and Lwai’s relationship, does not receive any attention, losing out on an important emotional connection. And many of the cast members are forgotten about once the second half rolls around – such as the kids, the big boss lady, and Albert, Kyouma’s closest friend and fellow Beast of Grendel. The cast is, simply put, weirdly handled. Arguably, the strongest part of Dimension W is its OP. The techno beat and feel easily fits alongside the technology, electric, and futuristic motifs. And the different tonal sections add variety without coming off as out of place. Admittedly, the English lyrics can be silly to hear (“Low resistance of high zest inner cells”), but the song is still a welcome addition to the anime. The ED does not reach the same heights. While the start of it is cool with its guitar work, and the ending is nice with its vocal work, the middle stretch of the piece leaves much to be desired as it somewhat strolls along despite the band’s loud interjection. As for the rest of the original soundtrack, it has a surprising number of interesting tracks. “Osoikuru-Mizukaranoteki” intertwines orchestra with acoustic guitar and castanets. “Yappariwakaranai” slows everything down with slick harmonica playing. “Kanashiki-Kioku,” with its choir and organ, invites a sense of foreboding. “Isshokusokuhatsu” builds suspense through clanging and light violins. And “Kesshi-no-Tatakai” goes grandiose to coincide with the later, larger scale. These tracks from the OST are not stellar, and, indeed, many of the pieces are rather average. But the they do at least have some care put into them. Finally, only a couple of shout-outs are deserved in terms of voice acting performances. Reina Ueda as Mira adds cuteness, personality, and life to the robotic girl, and Daisuke Ono as Kyouma proves his veteran status with a manly and peeved voice for the disgruntled main protagonist. Without a doubt, Mira was a lot of fun. In this world filled with angry dudes and potential death, I could count on Mira to make me smile. Her pouting when Kyouma was being mean, her kindness in dealing with others, and her happy face while holding hard-earned money had me grinning and laughing. Usually both. Mira’s antics with Kyouma were fun, too. Kyouma closing the bathroom door on Mira and Mira freaking out when Kyouma approached her from behind after she read all of those scary books were silly moments. I especially liked the rock-moving bit. Kyouma was having extreme difficulty moving even one rock, but Mira was tossing them aside like pebbles. I just wish there had been more of these moments. I also liked Albert. More specifically, I liked the relationship he shared with Kyouma. Albert was technically Kyouma’s enemy, but they were friends. It gave their dynamic a sense of camaraderie. That they understood each other’s positions and treated each other with respect. Similar to Kyouma and Mira, however, I wish that Albert had more scenes with his friend. Everything else, however, was not the most engaging for me. A lot of the action was either too over the top or lacking in coolness. The various dramatic bits, like Kyouma’s wife’s death or Loser’s death, didn’t get to me emotionally. And the other characters and plotlines were simply uninteresting. I was simply not entertained. 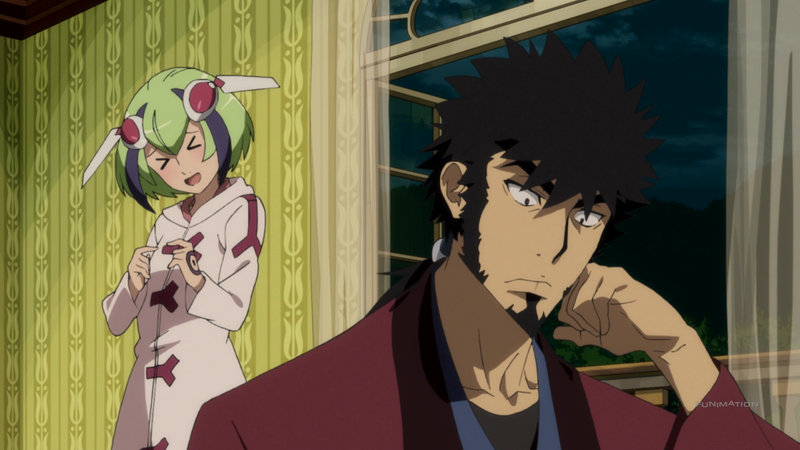 Dimension W gets lost amidst space and time. The story’s construction introduces a lot of problems, the characters are given odd levels of importance, and the art does not usually impress. Basically, the show’s batteries didn’t last.